purchase of an ozone generator. For larger UV ozone systems, see the UV PRO 2800, and UV PRO 4000, and the NEW! Ultra-High powered UV PRO 6800 commercial ozone generators. Also see the new! fully adjustable HVAC UV 560 Duct mounted ozone generator air purifier. This Ultraviolet UV ozone generator Produces ZERO nitrogen oxides, and the ozone output is unaffected by high humidity (two characteristics not possible with corona discharge ozone generators unless only pure oxygen is used for feed gas). 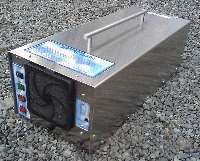 For Example, with just 50% humidity, this unit will produce as much ozone as a corona discharge ozone generator rated at 1,400mghr, and as some competitors do not rate ozone output conservatively, this unit will exceed the output of many machines rated much higher; even outperforming some rated at 2,000mghr. Most know that when the environment is very dry (as with freezing temperatures in the winter) static electricity discharge is often experienced. But in a warm or humid environment, the static electricity does not happen easily. The same effect is realized for ozone generators using the corona discharge technology. The corona process of an ozone generator is an abundance of controlled static electricity in a box and is greatly affected by the atmospheric humidity. Humidity reduces corona discharge activity. Regardless of claims, all corona discharge ambient air ozone generators are rated in a dry environment below 10% humidity. This is because some users, such as those in Arizona and other dry or desert areas will experience the maximum output from their corona discharge ozone generators in these areas because of the ultra-low humidity conditions, which is sometimes in the single digits. Also SEE Compare uv ozone generator to corona discharge ozone generators. less cleaning required & easier to clean - just wipe off the 2 ozone bulbs every 6 months of use! this unit produces 1430mghr for the first 170 hours of use, then very slowly levels off to the rated 1100mghr. this unit produces Hydroxyl Radicals as well as ozone. Hydroxyl Radicals are aggressive at killing germs that go through the machine, though they cannot travel throughout a building as their life expectancy is only a few seconds. It is the Ozone that travels throughout the building killing germs during shock treatments. This is not simply a UV sterilizer, ionizer or electronic air purifier. The UV PRO 1100T36 is a high output UV Ozone Generator. There is a big difference in the two types of UV bulbs used - often they are confused. o3ozone will be offering UV sterilizer bulbs that are interchangeable with the UV ozone producing bulbs of this machine for those wanting small room occupied air purification without high ozone production. The bulbs included in this machine produce high levels of ozone for shock treatments. With these ozone producing bulbs, ozone air purification of a room can usually be obtained in a just few minutes of use. Longer treatment times will result in high levels of ozone for shock treatment use - these high levels are for germ and mold killing treatments and should be done while no one is in the room. And so many more applications! Generation method: UV (ultraviolet) ozone technology. 2 15" UV tubes. Control options: On/Off rocker switch, and one shot timer standard on all models. Special features: The UV PRO 1100 comes equipped with 4" ozone output and fresh air input spouts. These “spouts” will hook up to a drier vent hose or other 4" hose. This feature allows the installer the route clean dry air into the ozone generator or route the ozone to where it is needed. In addition to producing large amounts of ozone, Air passing through the ozone generator is "SUPER STERILIZED" by UVC, B, & A. Warranty: The UV PRO 1100 is warranted against defects in materials and workmanship for a period of six years from date of purchase. Liability is limited to parts and labor only. Shipping is the sole responsibility of the customer. www.o3ozone.com is not liable for damage caused by shipping, misuse, neglect or lack of regular maintenance. No other ozone generator company stands behind their product as long! Uses: The UV PRO 1100 is designed for use as a shock treatment tool. Ideal for uses include odor, mold, fire and smoke remediation, garbage compactors, light to medium restoration, auto detailing, household disinfection, etc. The UV PRO 1100 can be used for air purification in large areas when distributed effectively by air handling systems (up to 7,000 sq. ft.), and is ideal for shock treatments (higher levels) for killing germs in moderately sized areas (up to approx. 1300 sq. ft.). Excellent choice for residential / small business shock treatment odor removal needs. Suitable for "shock treatments" of large household sized rooms, and basements. Capable of medium - large sized room shock treatments! CLICK HERE to see the full line of ozone generators for ODOR, smoke, MOLD, fire, Protein Decomposition ODORS, and flood remediation. Units are available with various outputs UV PRO 1100, 700, 1,000, 1,908, 2,600, 3,600, 5,000, UV PRO 2800, 9,000 mg/hr, and UV PRO 4000. Some of these units can be upgraded for higher outputs. New! fully adjustable HVAC UV 560 Duct mounted ozone generator air purifier.